Hall of Fame career is celebrated on this antique baseball glove by artist Sean Kane. 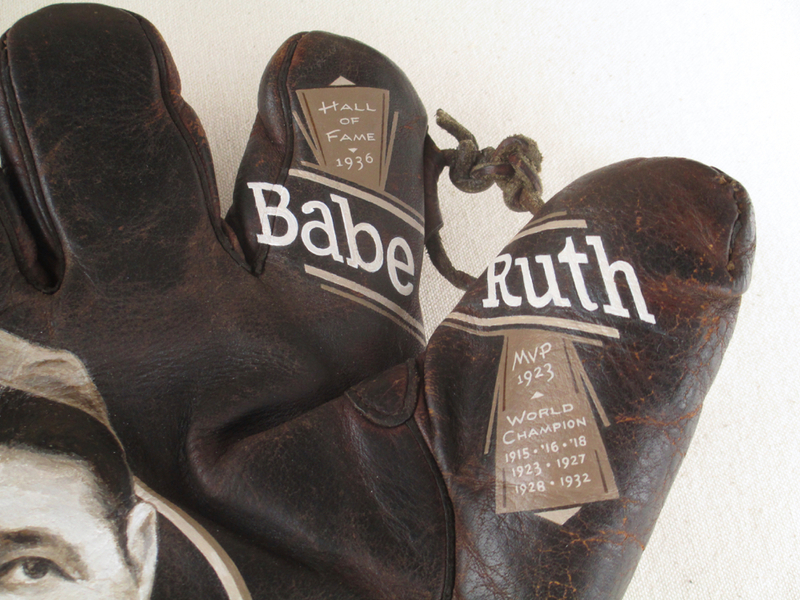 Ruth is celebrated with this hand-painted depiction on a glove from the era in which he played for the Bronx Bombers. The glove is a Draper & Maynard 1920’s model. Ruth endorsed and played with a D&M glove. The glove is for a left-handed thrower, like Ruth. Ruth’s 1923 MVP season and Hall of Fame induction in 1936 are noted. Ruth was on seven World Series Championship teams: the Boston Red Sox 1915, 1916, 1918 and New York Yankees in 1923, 1927, 1928 and 1932. This baseball glove art of Babe Ruth painted by Sean Kane is available for $3500. You will receive a prompt receipt with confirmation of purchase and shipping details.